Clockwise from left: Kathy's daughter Stephanie, Kathy, Kathy's husband John, Kathy's grandson Daniel, and Kathy's granddaughter Alexandra. 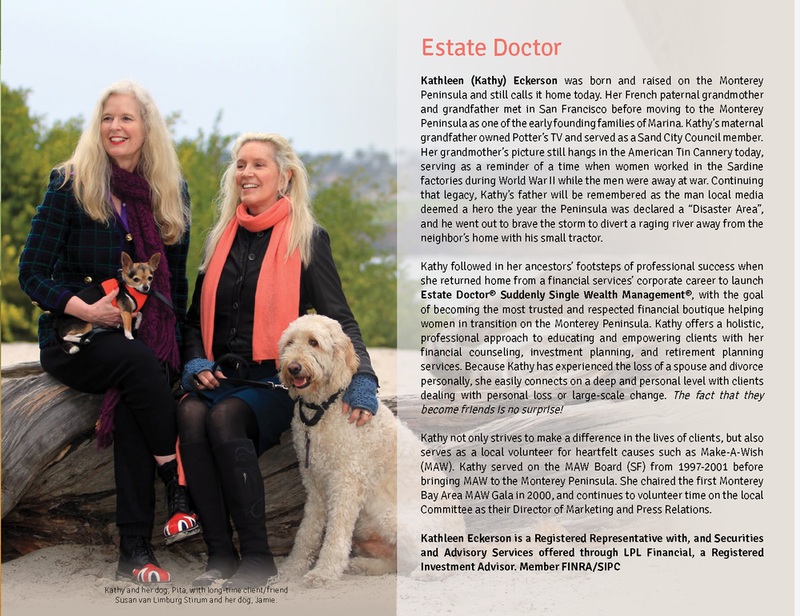 Kathleen Eckerson (or Kathy, as she is referred to by her clients and friends) provides wealth management services in Pebble Beach and on the Monterey Peninsula. 2) Making a difference in the lives of clients and heartfelt causes, like Make-A-Wish (which she brought to the Monterey Peninsula in 2000), the Carmel Bach Festival, the AT&T Golf Tournament, First Tee, and other worthwhile local causes. Kathy Eckerson and John Ivie married on Valentine’s Day at the Church in the Forest in Pebble Beach. It was a touching wedding with a musical program of Bach, Beethoven, Schubert and Mendelssohn played on piano and Organ, and a Soloist singing “The Prayer” and “Ave Maria” from a balcony. Following the ceremony, the reception took place in a vacant house in Pebble Beach that the couple had recently purchased and transformed into an intimate restaurant for their event. Guests received chocolate-framed photos of the couple alongside chocolate hearts. Every element of the wedding was organized to embody the theme, “ “Dreams Do Come True.” Kathy and John believe life is meant to be lived in joy and happiness. John is an engineer in Silicon Valley. Kathy was born locally. After serving on the Greater Bay Area Make-A-Wish Board in San Francisco for three years, Kathy brought Make-A-Wish (MAW) to the Monterey Peninsula in 2000 and launched its inaugural Monterey Bay Area MAW Gala. 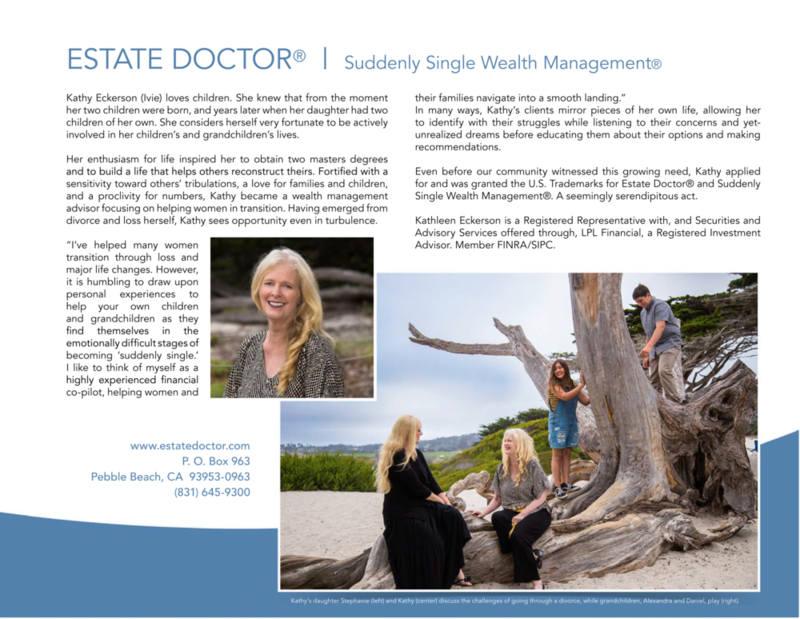 She also founded Estate Doctor® – Suddenly Single Wealth Management®, to help others pursue their dreams! Kathy and John are wonderful examples of how we can achieve our dreams, no matter what stage of life we find ourselves.